I’m excited to present to you the first of five lessons I’m doing on OnlineDrummer.com about beat modification. Essentially, we’re going to go through the steps that I would take in modifying a beat. Starting with a simple 7/8 groove and ending up with a composite meter pattern with multiple simultaneous polyrhythmic layers five videos from now. One on one online private lessons are now available! Appreciate all your tips mate!!! !….keep up the great work. solid Aaron and great explications…love your technique Take care ! always come back for the basic rythm and inspired young drummers the importance to know polyrythm. Sorry to how I distribute my worlds in english llölllll Daniel…have a great day ! Daniel…have a great day ! your wall is hella uber!!! What hammerax cymbals make up that awesome stack? You got new heads, what Evans series are they? @dhoudedrums Thanks man! 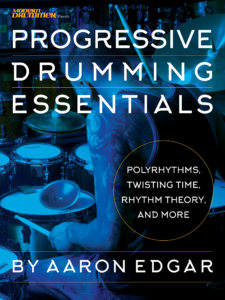 You take care as well, polyrhythms certainly are a blast to incorporate into your playing! @ibeavan No problem bro! Nashville from what I hear is a very cool place! @SONORSQ2guy I sure did! But this is actually a completely different kit than usual. This one is an S-Classix and the heads are J1 Etched with G1 clear bottoms. Kick is an EMAD with an EQ1 Frosted (batter) as a resonant. Gong drum, as always is EQ1 clear! I’m not even a drummer, but I know a great music teacher when I see one. And I am loving those Hammerax cymbals because they don’t wash everything else out when you hit ’em. If I can understand this stuff as a guitar player, I can only imagine how this stuff helps actual drummers. I heard about Aaron through Andrew Wasson’s Creative Guitar Studio channel – gotta give him credit for that I reckon. @aaronedgardrum So are you sponsored by Evan’s now? hudson music’s facebook send me here, youre awesome! I subscribed! @c0d3x001 That totally makes sense! And I LOVE Sudoku! I used to slay Sudoku nightly between sets at gigs on my phone when I was younger! @axedstoninst Ah fair enough! Well, either way, I’m stoked you’re using the stuff! Thanks Aaron! Keep it happening! I remember your firsts videos, now you’re getting a lot more views.. and you deserved.. Cheers bro, I hope you remember me! I remember your firsts videos, now you’re getting a lot more views..﻿ and you deserved.. I remember your﻿ firsts videos, now you’re getting a lot more views.. and you deserved.. I remember your firsts﻿ videos, now you’re getting a lot more views.. and you deserved.. I remember your firsts videos, now you’re getting a lot more views.. and you﻿ deserved.. I remember﻿ your firsts videos, now you’re getting a lot more views.. and you deserved.. Cheers bro,﻿ I hope you remember me! Cheers bro, I hope you remember﻿ me! I remember your firsts videos, now you’re getting a lot more views.. and﻿ you deserved.. Cheers bro, I﻿ hope you remember me! I remember your firsts videos, now you’re getting a lot﻿ more views.. and you deserved.. I remember your firsts videos, now﻿ you’re getting a lot more views.. and you deserved.. I remember your firsts videos, now you’re﻿ getting a lot more views.. and you deserved.. Cheers bro, I hope﻿ you remember me! I remember your firsts videos, now you’re getting a lot more﻿ views.. and you deserved.. I remember your firsts videos, now you’re getting a﻿ lot more views.. and you deserved..
Cheers﻿ bro, I hope you remember me! I remember your firsts videos, now you’re getting﻿ a lot more views.. and you deserved..
I﻿ remember your firsts videos, now you’re getting a lot more views.. and you deserved.. I remember your firsts videos,﻿ now you’re getting a lot more views.. and you deserved.. Cheers bro, I hope you﻿ remember me! [..YouTube..] I remember your firsts videos, now you’re getting a lot more views.. and you deserved..
you deserved.. Cheers bro, I hope you remember me! Man, I LOVE these lessons! It’s a tad hard for me though, i’ve only been drumming﻿ for 6 years and it’s a bit of an info cramp haha. Man, I LOVE these lessons! It’s a tad hard for me though, i’ve only been drumming for 6 years﻿ and it’s a bit of an info cramp haha. Man, I LOVE these lessons! It’s a tad hard for me though, i’ve﻿ only been drumming for 6 years and it’s a bit of an info cramp haha. Man, I LOVE these lessons! It’s a tad hard for me though, i’ve only been drumming for 6 years and it’s a bit﻿ of an info cramp haha. Man, I LOVE these lessons! It’s﻿ a tad hard for me though, i’ve only been drumming for 6 years and it’s a bit of an info cramp haha. Man, I LOVE these lessons! It’s a tad hard for me though, i’ve only been drumming for﻿ 6 years and it’s a bit of an info cramp haha. Man, I LOVE these lessons! It’s a tad hard for me though, i’ve only been drumming for 6 years and it’s a﻿ bit of an info cramp haha. Man,﻿ I LOVE these lessons! It’s a tad hard for me though, i’ve only been drumming for 6 years and it’s a bit of an info cramp haha. Man, I LOVE these lessons! It’s a tad hard for me though,﻿ i’ve only been drumming for 6 years and it’s a bit of an info cramp haha. Man, I LOVE these﻿ lessons! It’s a tad hard for me though, i’ve only been drumming for 6 years and it’s a bit of an info cramp haha. Man, I LOVE these lessons! It’s a tad hard﻿ for me though, i’ve only been drumming for 6 years and it’s a bit of an info cramp haha. Man, I LOVE these lessons! It’s a tad hard for me though, i’ve only been﻿ drumming for 6 years and it’s a bit of an info cramp haha. Man, I LOVE these lessons! It’s a tad hard for me though, i’ve only﻿ been drumming for 6 years and it’s a bit of an info cramp haha. Man, I LOVE these lessons! It’s a tad﻿ hard for me though, i’ve only been drumming for 6 years and it’s a bit of an info cramp haha. Man, I LOVE these lessons! It’s a tad hard for﻿ me though, i’ve only been drumming for 6 years and it’s a bit of an info cramp haha. Man, I LOVE these lessons! It’s a tad hard for me though, i’ve only been drumming for 6 years and it’s a bit of﻿ an info cramp haha. Man, I LOVE these lessons! It’s a tad hard for me though, i’ve only been drumming for 6 years and it’s a bit of an info﻿ cramp haha. Man, I LOVE these lessons! It’s a tad hard for me though, i’ve only been drumming for 6 years and it’s a bit of an info cramp﻿ haha. Man, I LOVE these lessons! It’s a tad hard for me﻿ though, i’ve only been drumming for 6 years and it’s a bit of an info cramp haha. Man, I LOVE these lessons!﻿ It’s a tad hard for me though, i’ve only been drumming for 6 years and it’s a bit of an info cramp haha. Man, I LOVE these lessons! It’s a tad hard for me though, i’ve only been drumming for 6 years and﻿ it’s a bit of an info cramp haha. Man, I LOVE﻿ these lessons! It’s a tad hard for me though, i’ve only been drumming for 6 years and it’s a bit of an info cramp haha. Man, I LOVE these lessons! It’s a tad hard for me though, i’ve only been drumming for 6 years and it’s﻿ a bit of an info cramp haha. Man, I﻿ LOVE these lessons! It’s a tad hard for me though, i’ve only been drumming for 6 years and it’s a bit of an info cramp haha. Man, I LOVE these lessons! It’s a tad hard for me though, i’ve only been drumming for 6 years and it’s a bit of an﻿ info cramp haha. [..YouTube..] Man, I LOVE these lessons! It’s a tad hard for me though, i’ve only been drumming for 6 years and it’s a bit of an info cramp haha. Man, I LOVE these lessons! It’s a tad hard for me though, i’ve only been drumming for 6 years and it’s a bit of an info cram, haha. Man, I LOVE these﻿ lessons! It’s a tad hard for me though, i’ve only been drumming for 6 years and it’s a bit of an info cram, haha. Man, I LOVE these lessons! It’s a tad hard for me though, i’ve only been drumming for﻿ 6 years and it’s a bit of an info cram, haha. Man, I LOVE these lessons! It’s a tad hard﻿ for me though, i’ve only been drumming for 6 years and it’s a bit of an info cram, haha. Man, I LOVE these lessons! It’s a tad hard for me though, i’ve only been drumming﻿ for 6 years and it’s a bit of an info cram, haha. Man, I LOVE these lessons! It’s a tad hard for me though, i’ve﻿ only been drumming for 6 years and it’s a bit of an info cram, haha. Man, I LOVE these lessons! It’s a tad hard for me though, i’ve only been drumming for 6 years﻿ and it’s a bit of an info cram, haha. Man, I LOVE these lessons! It’s a tad hard for﻿ me though, i’ve only been drumming for 6 years and it’s a bit of an info cram, haha. Man, I LOVE these lessons! It’s a tad hard for me though, i’ve only been drumming for 6 years and it’s a bit of an info﻿ cram, haha. Man, I LOVE﻿ these lessons! It’s a tad hard for me though, i’ve only been drumming for 6 years and it’s a bit of an info cram, haha. Man, I LOVE these lessons! It’s a tad hard for me though, i’ve only been drumming for 6 years and it’s a bit of an info cram,﻿ haha. Man, I﻿ LOVE these lessons! It’s a tad hard for me though, i’ve only been drumming for 6 years and it’s a bit of an info cram, haha. Man, I LOVE these lessons! It’s﻿ a tad hard for me though, i’ve only been drumming for 6 years and it’s a bit of an info cram, haha. Man, I LOVE these lessons! It’s a tad hard for me though, i’ve only been drumming for 6 years and it’s a bit﻿ of an info cram, haha. Man, I LOVE these lessons! It’s a tad hard for me though, i’ve only been drumming for 6 years and it’s a bit of﻿ an info cram, haha. Man, I LOVE these lessons! It’s a tad hard for me though, i’ve only been drumming for 6 years and it’s a﻿ bit of an info cram, haha. Man, I LOVE these lessons! It’s a tad hard for me though, i’ve only been drumming for 6 years and it’s a bit of an﻿ info cram, haha. Man, I LOVE these lessons! It’s a tad hard for me though, i’ve only been﻿ drumming for 6 years and it’s a bit of an info cram, haha. Man, I LOVE these lessons! It’s a﻿ tad hard for me though, i’ve only been drumming for 6 years and it’s a bit of an info cram, haha. Man, I LOVE these lessons! It’s a tad hard for me though, i’ve only﻿ been drumming for 6 years and it’s a bit of an info cram, haha. Man, I LOVE these lessons! It’s a tad hard for me though,﻿ i’ve only been drumming for 6 years and it’s a bit of an info cram, haha. Man, I LOVE these lessons! It’s a tad hard for me though, i’ve only been drumming for 6 years and﻿ it’s a bit of an info cram, haha. Man, I LOVE these lessons! It’s a tad hard for me though, i’ve only been drumming for 6 years and it’s﻿ a bit of an info cram, haha. [..YouTube..] Man, I LOVE these lessons! It’s a tad hard for me though, i’ve only been drumming for 6 years and it’s a bit of an info cram, haha. drumming for 6 years and it’s a bit of an info cram, haha. @Oli4drums That’s awesome man! It’s pretty sweet that you’re diggin’ em! If you want some similar stuff that goes a little more into detail about each part, check the videos I annotated during this one, there’s more about time signatures and polyrhythms! @Oli4drums That’s awesome man! It’s pretty sweet that you’re diggin’ em! If you want some similar stuff that goes﻿ a little more into detail about each part, check the videos I annotated during this one, there’s more about time signatures and polyrhythms! @Oli4drums That’s awesome man! It’s pretty sweet that you’re diggin’ em! If you want some similar stuff﻿ that goes a little more into detail about each part, check the videos I annotated during this one, there’s more about time signatures and polyrhythms! @Oli4drums That’s awesome man! It’s pretty sweet that you’re diggin’ em! If you want some similar stuff that goes a little more into detail about each part, check the videos I annotated during this one, there’s more about time﻿ signatures and polyrhythms! @Oli4drums That’s awesome man! It’s﻿ pretty sweet that you’re diggin’ em! If you want some similar stuff that goes a little more into detail about each part, check the videos I annotated during this one, there’s more about time signatures and polyrhythms! @Oli4drums﻿ That’s awesome man! It’s pretty sweet that you’re diggin’ em! If you want some similar stuff that goes a little more into detail about each part, check the videos I annotated during this one, there’s more about time signatures and polyrhythms! @Oli4drums That’s awesome man! It’s pretty sweet that you’re diggin’ em! If you want some similar stuff that﻿ goes a little more into detail about each part, check the videos I annotated during this one, there’s more about time signatures and polyrhythms! @Oli4drums That’s awesome man! It’s pretty sweet that you’re diggin’ em! If you want some similar stuff that goes a little more into﻿ detail about each part, check the videos I annotated during this one, there’s more about time signatures and polyrhythms! @Oli4drums That’s awesome man! It’s pretty sweet that you’re diggin’ em! If you want some similar stuff that goes a little more into detail about each part, check the videos I annotated during this one, there’s﻿ more about time signatures and polyrhythms! @Oli4drums That’s awesome man! It’s pretty sweet that you’re diggin’ em! If you want some similar stuff that goes a little more into detail about each part, check the videos I annotated during this one, there’s more﻿ about time signatures and polyrhythms! @Oli4drums That’s awesome man! It’s pretty sweet that you’re diggin’﻿ em! If you want some similar stuff that goes a little more into detail about each part, check the videos I annotated during this one, there’s more about time signatures and polyrhythms! @Oli4drums That’s awesome man! It’s pretty sweet that you’re diggin’ em! If you want some similar stuff that goes a little more into detail about each part, check the videos I annotated during this one, there’s more about time signatures﻿ and polyrhythms! @Oli4drums That’s awesome man!﻿ It’s pretty sweet that you’re diggin’ em! If you want some similar stuff that goes a little more into detail about each part, check the videos I annotated during this one, there’s more about time signatures and polyrhythms! @Oli4drums That’s awesome man! It’s pretty sweet that you’re diggin’ em! If you want some similar stuff that goes a little more into detail about each part, check the videos I annotated during this one,﻿ there’s more about time signatures and polyrhythms! @Oli4drums That’s awesome man! It’s pretty sweet that you’re diggin’ em! If you want some similar stuff that goes a little more into detail about each part, check﻿ the videos I annotated during this one, there’s more about time signatures and polyrhythms! @Oli4drums That’s awesome man! It’s pretty sweet that you’re diggin’ em! If you want some similar stuff that goes a little more into detail about each part, check the videos I annotated﻿ during this one, there’s more about time signatures and polyrhythms! @Oli4drums That’s awesome﻿ man! It’s pretty sweet that you’re diggin’ em! If you want some similar stuff that goes a little more into detail about each part, check the videos I annotated during this one, there’s more about time signatures and polyrhythms! @Oli4drums That’s awesome man! It’s pretty sweet that you’re diggin’ em! If you want some similar stuff that goes a little more into detail﻿ about each part, check the videos I annotated during this one, there’s more about time signatures and polyrhythms! @Oli4drums That’s awesome man! It’s pretty sweet that﻿ you’re diggin’ em! If you want some similar stuff that goes a little more into detail about each part, check the videos I annotated during this one, there’s more about time signatures and polyrhythms! @Oli4drums That’s awesome man! It’s pretty sweet that you’re diggin’ em! If you want some similar stuff that goes a little more into detail about each part,﻿ check the videos I annotated during this one, there’s more about time signatures and polyrhythms! @Oli4drums That’s﻿ awesome man! It’s pretty sweet that you’re diggin’ em! If you want some similar stuff that goes a little more into detail about each part, check the videos I annotated during this one, there’s more about time signatures and polyrhythms! @Oli4drums That’s awesome man! It’s pretty sweet that you’re diggin’ em!﻿ If you want some similar stuff that goes a little more into detail about each part, check the videos I annotated during this one, there’s more about time signatures and polyrhythms! @Oli4drums That’s awesome man! It’s pretty sweet that you’re diggin’ em! If you want some similar stuff that goes a little more into detail about each part, check the videos I﻿ annotated during this one, there’s more about time signatures and polyrhythms! @Oli4drums That’s awesome man! It’s pretty sweet that you’re diggin’ em! If you want﻿ some similar stuff that goes a little more into detail about each part, check the videos I annotated during this one, there’s more about time signatures and polyrhythms! @Oli4drums That’s awesome man! It’s pretty sweet that you’re diggin’ em! If you want some similar stuff that goes a little more into detail about each part, check the videos I annotated during this﻿ one, there’s more about time signatures and polyrhythms! @Oli4drums That’s awesome man! It’s pretty sweet that you’re diggin’ em! If you want some﻿ similar stuff that goes a little more into detail about each part, check the videos I annotated during this one, there’s more about time signatures and polyrhythms! @Oli4drums That’s awesome man! It’s pretty sweet that you’re diggin’ em! If you want some similar﻿ stuff that goes a little more into detail about each part, check the videos I annotated during this one, there’s more about time signatures and polyrhythms! @Oli4drums That’s awesome man! It’s pretty sweet that you’re diggin’ em! If you want some similar stuff that goes a little more into detail about each﻿ part, check the videos I annotated during this one, there’s more about time signatures and polyrhythms! @Oli4drums That’s awesome man! It’s pretty sweet that you’re diggin’ em! If you want some similar stuff that goes a little﻿ more into detail about each part, check the videos I annotated during this one, there’s more about time signatures and polyrhythms! [..YouTube..] @Oli4drums That’s awesome man! It’s pretty sweet that you’re diggin’ em! If you want some similar stuff that goes a little more into detail about each part, check the videos I annotated during this one, there’s more about time signatures and polyrhythms! [..YouTube..] That’s awesome man! It’s pretty sweet that you’re diggin’ em! If you want some similar stuff that goes a little more into detail about each part, check the videos I annotated during this one, there’s more about time signatures and polyrhythms! whats that stack on your right? whats that stack on﻿ your right? whats﻿ that stack on your right? whats that stack﻿ on your right? whats that﻿ stack on your right? whats that stack on your﻿ right? [..YouTube..] whats that stack on your right? Very informative Aaron. ﻿ Thanks. [..YouTube..] Very informative Aaron. Thanks. @alzhaimar Possibly, but I know they have a bunch of new dealer contracts, so maybe not as hard as you think! @alzhaimar Possibly,﻿ but I know they have a bunch of new dealer contracts, so maybe not as hard as you think! @alzhaimar Possibly, but I know they have a bunch of new dealer contracts, so maybe not as hard﻿ as you think! @alzhaimar Possibly, but﻿ I know they have a bunch of new dealer contracts, so maybe not as hard as you think! @alzhaimar Possibly, but I know they have a bunch of new dealer contracts, so maybe﻿ not as hard as you think! @alzhaimar Possibly, but I know they have a bunch of new﻿ dealer contracts, so maybe not as hard as you think! @alzhaimar Possibly, but I know they﻿ have a bunch of new dealer contracts, so maybe not as hard as you think! @alzhaimar Possibly, but I know they have a bunch of new dealer contracts, so maybe not as hard as﻿ you think! @alzhaimar Possibly, but I know they have a bunch of new dealer contracts, so maybe not﻿ as hard as you think! @alzhaimar Possibly, but I know they have a bunch of﻿ new dealer contracts, so maybe not as hard as you think! @alzhaimar Possibly, but I know they have a bunch of new dealer contracts, so﻿ maybe not as hard as you think! @alzhaimar Possibly, but I know they have a﻿ bunch of new dealer contracts, so maybe not as hard as you think! @alzhaimar Possibly, but I know﻿ they have a bunch of new dealer contracts, so maybe not as hard as you think! @alzhaimar Possibly, but I﻿ know they have a bunch of new dealer contracts, so maybe not as hard as you think! @alzhaimar Possibly, but I know they have a bunch of new dealer﻿ contracts, so maybe not as hard as you think! @alzhaimar Possibly, but I know they have a bunch of new dealer contracts, so maybe not as hard as you﻿ think! @alzhaimar Possibly, but I know they have a bunch﻿ of new dealer contracts, so maybe not as hard as you think! @alzhaimar﻿ Possibly, but I know they have a bunch of new dealer contracts, so maybe not as hard as you think! @alzhaimar Possibly, but I know they have a bunch of new dealer contracts, so maybe not as﻿ hard as you think! @alzhaimar Possibly, but I know they have﻿ a bunch of new dealer contracts, so maybe not as hard as you think! @alzhaimar Possibly, but I know they have a bunch of new dealer contracts,﻿ so maybe not as hard as you think! [..YouTube..] @alzhaimar Possibly, but I know they have a bunch of new dealer contracts, so maybe not as hard as you think! [..YouTube..] Possibly, but I know they have a bunch of new dealer contracts, so maybe not as hard as you think! Possibly, but I know they have a bunch of new dealer contracts, so maybe not as hard as you think! holy crap. not only is he an amazing drummer, he’s an amazing teacher! (nice groove on the bleed kick rhythm at the end.) i’m more impressed with each video i watch and each song i hear. holy crap. not only is he an amazing drummer, he’s an amazing teacher! (nice groove on the bleed kick rhythm at the end.) i’m more impressed﻿ with each video i watch and each song i hear. holy crap. not only is he an amazing drummer, he’s an amazing teacher! (nice groove on the bleed kick rhythm﻿ at the end.) i’m more impressed with each video i watch and each song i hear. holy crap. not﻿ only is he an amazing drummer, he’s an amazing teacher! (nice groove on the bleed kick rhythm at the end.) i’m more impressed with each video i watch and each song i hear. holy crap. not only is he an amazing drummer, he’s an amazing teacher! (nice groove on the bleed kick rhythm at the end.) i’m more impressed with each video i watch and﻿ each song i hear. holy crap. not only is he an amazing drummer, he’s an amazing teacher! (nice groove on﻿ the bleed kick rhythm at the end.) i’m more impressed with each video i watch and each song i hear. holy crap. not only is he an amazing drummer, he’s an amazing﻿ teacher! (nice groove on the bleed kick rhythm at the end.) i’m more impressed with each video i watch and each song i hear. holy crap. not only is he﻿ an amazing drummer, he’s an amazing teacher! (nice groove on the bleed kick rhythm at the end.) i’m more impressed with each video i watch and each song i hear. holy crap. not only is﻿ he an amazing drummer, he’s an amazing teacher! (nice groove on the bleed kick rhythm at the end.) i’m more impressed with each video i watch and each song i hear. holy crap. not only is he an amazing drummer, he’s an amazing teacher! (nice groove on the bleed kick rhythm at the end.) i’m more impressed with﻿ each video i watch and each song i hear. holy crap. not only is he an amazing drummer, he’s an amazing teacher!﻿ (nice groove on the bleed kick rhythm at the end.) i’m more impressed with each video i watch and each song i hear. holy crap. not only is he an amazing drummer, he’s ﻿ an amazing teacher! (nice groove on the bleed kick rhythm at the end.) i’m more impressed with each video i watch and each song i hear. holy crap. not only is he an amazing drummer, he’s an amazing teacher! (nice groove on the﻿ bleed kick rhythm at the end.) i’m more impressed with each video i watch and each song i hear. holy crap. not only is he an amazing drummer, he’s an amazing teacher! (nice groove on the bleed﻿ kick rhythm at the end.) i’m more impressed with each video i watch and each song i hear. holy crap. not only is he an﻿ amazing drummer, he’s an amazing teacher! (nice groove on the bleed kick rhythm at the end.) i’m more impressed with each video i watch and each song i hear. holy crap. not only is he an amazing drummer, he’s an amazing teacher! (nice groove on the bleed kick rhythm at the end.) i’m more impressed with each video i﻿ watch and each song i hear. holy crap. not only is he an amazing drummer, he’s an amazing teacher! (nice groove on the bleed kick rhythm at the end.) i’m more impressed with each﻿ video i watch and each song i hear. holy crap. not only﻿ is he an amazing drummer, he’s an amazing teacher! (nice groove on the bleed kick rhythm at the end.) i’m more impressed with each video i watch and each song i hear. holy crap. not only is he an amazing drummer, he’s﻿ an amazing teacher! (nice groove on the bleed kick rhythm at the end.) i’m more impressed with each video i watch and each song i hear. holy crap. not only is he an amazing drummer, he’s an amazing teacher! (nice groove﻿ on the bleed kick rhythm at the end.) i’m more impressed with each video i watch and each song i hear. holy﻿ crap. not only is he an amazing drummer, he’s an amazing teacher! (nice groove on the bleed kick rhythm at the end.) i’m more impressed with each video i watch and each song i hear. holy crap. not only is he an amazing drummer, he’s an amazing teacher! (nice groove on the bleed kick rhythm at the end.) i’m more﻿ impressed with each video i watch and each song i hear. holy crap. not only is he an amazing drummer, he’s an amazing teacher! (nice groove on the bleed kick rhythm at the end.) i’m more impressed with each video i watch and each song i﻿ hear. holy crap. not only is he an amazing drummer, he’s an amazing teacher! (nice groove on the bleed kick rhythm at the end.) i’m more impressed with each video i watch and each﻿ song i hear. holy crap. not only is he an amazing drummer, he’s an amazing teacher! (nice groove on the bleed kick rhythm at the end.) i’m more impressed with each video﻿ i watch and each song i hear. holy crap. not only is he an amazing drummer, he’s an amazing teacher! (nice groove on the bleed kick rhythm at the end. )﻿ i’m more impressed with each video i watch and each song i hear. holy crap. not only is he an amazing drummer, he’s an amazing teacher! (nice groove on the bleed kick rhythm at the end.) i’m more impressed with each video i watch﻿ and each song i hear. holy crap. not only is he an amazing drummer, he’s an amazing teacher! (nice groove on the bleed kick rhythm at the end.) i’m more impressed with each video i watch and each song﻿ i hear. holy crap. not only is he an amazing drummer, he’s an amazing teacher! (nice groove on the bleed kick rhythm at﻿ the end.) i’m more impressed with each video i watch and each song i hear. holy crap. not only is he an amazing drummer, he’s an amazing teacher! (nice groove on the bleed kick﻿ rhythm at the end.) i’m more impressed with each video i watch and each song i hear. holy crap. not only is he an amazing drummer,﻿ he’s an amazing teacher! (nice groove on the bleed kick rhythm at the end.) i’m more impressed with each video i watch and each song i hear. [..YouTube..] holy crap. not only is he an amazing drummer, he’s an amazing teacher! (nice groove on the bleed kick rhythm at the end.) i’m more impressed with each video i watch and each song i hear. Are you using a coated G1 for the snare? How do the Etched J1’s compare in sound to the G Plus tom heads . Thanks. Are you using a coated G1 for the snare? How do the Etched J1’s compare in sound to the G Plus﻿ tom heads . Thanks. Are you using a coated G1 for the snare? How do the Etched J1’s compare﻿ in sound to the G Plus tom heads . Thanks. Are you using a coated G1 for the snare? How do the Etched J1’s compare in sound to the G Plus tom heads﻿ . Thanks. Are you using a coated G1 for the snare? How do the Etched J1’s compare in sound to the G﻿ Plus tom heads . Thanks. Are you using a coated G1 for the snare?﻿ How do the Etched J1’s compare in sound to the G Plus tom heads . Thanks. Are you using a coated G1 for the snare? How﻿ do the Etched J1’s compare in sound to the G Plus tom heads . Thanks. Are you using a coated G1 for the snare? How do the Etched J1’s compare in sound﻿ to the G Plus tom heads . Thanks. Are you using a coated G1 for the snare? How do the﻿ Etched J1’s compare in sound to the G Plus tom heads . Thanks. Are you using a coated﻿ G1 for the snare? How do the Etched J1’s compare in sound to the G Plus tom heads . Thanks. Are you using a coated G1 for the snare? How do the Etched J1’s compare in sound to﻿ the G Plus tom heads . Thanks. Are you using a coated G1 for the snare? How do the Etched﻿ J1’s compare in sound to the G Plus tom heads . Thanks. Are you using a coated G1 for the snare? How do﻿ the Etched J1’s compare in sound to the G Plus tom heads . Thanks. Are﻿ you using a coated G1 for the snare? How do the Etched J1’s compare in sound to the G Plus tom heads . Thanks. Are you using a coated G1 for the snare? How do the Etched J1’s compare in sound to the G Plus tom heads .﻿ Thanks. Are you using a coated G1 for the﻿ snare? How do the Etched J1’s compare in sound to the G Plus tom heads . Thanks. Are you using a coated G1 for the snare? How do the Etched J1’s compare in﻿ sound to the G Plus tom heads . Thanks. Are you using a coated G1 for﻿ the snare? How do the Etched J1’s compare in sound to the G Plus tom heads . Thanks. Are you using a coated G1 for the snare? How do the Etched J1’s compare in sound to the G Plus tom﻿ heads . Thanks. Are you using a﻿ coated G1 for the snare? How do the Etched J1’s compare in sound to the G Plus tom heads . Thanks. Are you using﻿ a coated G1 for the snare? How do the Etched J1’s compare in sound to the G Plus tom heads . Thanks. Are you﻿ using a coated G1 for the snare? How do the Etched J1’s compare in sound to the G Plus tom heads . Thanks. Are you using a coated G1﻿ for the snare? How do the Etched J1’s compare in sound to the G Plus tom heads . Thanks. Are you using a coated G1 for the snare? How do the Etched J1’s compare in sound to the﻿ G Plus tom heads . Thanks. [..YouTube..] Are you using a coated G1 for the snare? How do the Etched J1’s compare in sound to the G Plus tom heads . Thanks. [..YouTube..] you’re like the mad scientist of drumming!! This is really enjoyable! you’re like the mad scientist of drumming!! This is really enjoyable! [..YouTube..] I’m a guitarist and i’ve always had trouble understanding time signatures; however, after your lesson i feel like the concept of time signatures is inspiring. Thanks and your a great teacher! I’m a guitarist and i’ve always had trouble understanding time signatures; however, after your lesson i feel like the concept of time signatures is inspiring. Thanks and your a great teacher! I saw your video on drumeo, good job teaching polyrhythms. Keep up the good work & looking fwd for world beat videos.